Geektastic is a book that I glanced at in a bookstore awhile ago but didn't buy. I was pleasantly surprised that my library carried a copy, so I checked it out. It is a series of short stories written by well known YA authors including John Green, Libba Bra, Cassandra Clare, and many more. I expected it to be a series of non-fiction essays about the authors' geeky pasts, but instead there were fictional essays about wonderfully geeky characters who struggle as teens but have a happy experience in their respective stories. My feelings while reading the stories vacillated. Much of the time, I admired these kids who were all so intelligent and so passionate about what they loved, whether it was Star Trek, MMPORGs, dinosaurs, etc. The rest of the time I had the *wrong* thoughts of "wow, at least I wasn't that much of a loser in high school." (when in truth, I was as much or more a "loser" as any of these kids). As is typical in short story collections, I liked some stories better than others. To my surprise, the stories written by the best known authors John Green, Libba Bray, and Cassandra Clare were only middling quality. In fact, John and Libba's stories were my least favorites. They were both fine stories, but nothing that stood out to me. John's story was too short to develop the characters or the plot adequately. My favorite story was probably "The Truth About Dino Girl" by Barry Lyga. It's about a freshman girl who is obsessed with dinosaurs. And lacks a few social skills. When she's humiliated by an upperclass girl whom she had previously admired, she gets her revenge. Revenge without consequences or conscience is perhaps not the best message to send, but anyone who's ever been bullied knows, it's immensely satisfying. I think my second favorite story was "Quiz Bowl Antichrist" by David Levithan. It's about a misfit group of kids at a quiz bowl tournament, but really it's about a kid who acknowledges that he's part of the loser group, but still thinks he's above the other losers. It features a colorful group of quiz bowlers that was fun to read about and the main character comes to understand that he teammates are people to be respected rather than condescended to. Us book bloggers are all geeks in some fashion. Maybe you geek out over Doctor Who or Buffy or Supernatural or Hunger Games or Harry Potter or even just books in general. 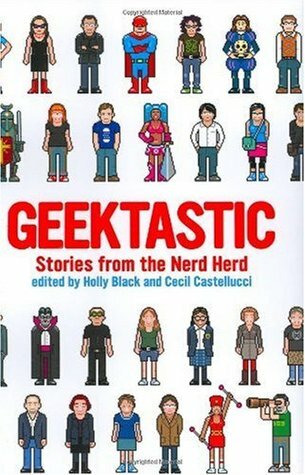 Geektastic has a great set of stories about characters who you'll identify with, even if you don't understand what they're passionate about. And, if you find any of the stories tedious, flip through a few pages, and you'll be onto the next. How have I never heard of this one before when there are so many great authors who contributed?? (Actually, I'm guessing it's because it's from 2009 and I'm remarkably and lamely ignorant of books pre-2010, when I first started blogging). A girl who is obsessed with dinosaurs and lacks social skills? Well, that's me to a T! It's always hard with short stories, especially with famous authors like John Green and Libba Bray, who need room to develop those memorable characters. I have been eyeing this book for some time now, I love all things Cecil Castellucci! I might just have to break down and pick it up next shopping trip. Oh, wow. I've never even heard of this one before, but I really love quirky books (especially about nerds). This one is a must-have on my list now! This has lots of authors that I adore so yeah, I think I should pick it up as well. Thanks for sharing. I hadn't heard of this book before now. I LOVE LOVE anthologies. There aren't enough of them I don't think... or enough of them about geeks. I am looking at my library right now. Be on the look out... I will review this book soon! Alison, I just finished The Astonishing Adventures of Fanboy and Goth Girl by Barry Lyga. It was his first novel and it was published back in 2006. I'll have a review posted in couple of weeks! I really enjoyed this anthology of short stories. I don't read too many of them but I couldn't pass this one up because it had all of my favorite writers. I like how the stories focus on people who aren't ashamed to show their enthusiasm and passion much like John Green's Nerdfighters!